A retweet from @belitabrux drew my attention today to a Mostra e-book called Opinion Corner. Take a look – it’s well researched, looks smartly designed… but why does it exist? It’s not that different from the (paper) Shift>Mag published by Tipik in Brussels, a publication that I’ve written for a couple of times. It’s smartly printed and has its own website but if the 10 people that have voted in their recent poll is indicative of the number of web visitors, it’s not immensely popular or relevant. Again why? What is the cost per visitor, the cost per reader of each of these initiatives? Both Tipik and Mostra are communications agencies that work almost uniquely for the EU institutions. Indeed Mostra’s portfolio for the last 12 months shows nothing but EU institutional clients, and Tipik counts a dozen Commission DGs in its references, and it has 160 staff in Brussels. It simply strikes me that the EU institutions paranoia about being disliked by EU citizens means there’s a determination to do something, to talk, to debate, to communicate – but without clear goals or objectives. Mostra, Tipik and others exist to serve this paranoia, developing large Brussels operations that can feed off the institutions’ cash. It’s especially interesting to read that Mostra was responsible for the Gender Pay Gap campaign of the European Commission. What, I wonder, were the demonstrable, measurable achievements of the campaign? And at what cost? 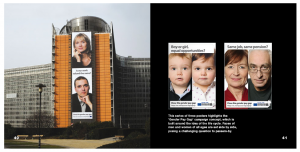 (See pages 38-41 of the Mostra 2009 portfolio) Just the crane to put up the banner on the Berlaymont will have been more costly than the entire Gender Balanced Commission effort I was involved with. In the meantime I am pottering around the edges of all of this, working professionally with individual MEPs and small NGOs in the Brussels sphere, people who think that €500 is a lot to pay for a content management system based website. For me Mostra and Tipik and their ilk seem to be some sort of parallel EU communications universe, something I cannot begin to relate to. Communications concours – should I go for it? @Brusselblogger, “there are no built in processes that guarantee feedback about the contractors performance to the contracting authority” – that may be your experience, but it’s not universal. It’s all down to the individual framework, written and implemented by EC officials. The ones I’m involved with all involve monitoring and analysing KPIs. The advantage of frameworks is the medium-term strategic perspective client and contractor can develop and implement. If each individual job was tendered out there’d be no strategic consistency, as was the case in the 90s before FWCs. The admin costs for the EC would also be huge. The biggest problem is the one you mention – previous work is not evaluated. This is the only reason some companies in this sector bid using ridiculously, unrealistically low offers; win the job; deliver terrible work and rip off the EC; and still keep going. I’d like to add one more aspect in this debate: companies like Tipik and Mostra don’t bid for individual contracts. They are so called framework contractors having won for example a 4 year “framework contract” in the area of Communication. – No evaluation of past work for future bids: this is indeed tricky as the incumbent would be partly evaluated on past work while others not. But somehow the past performance should be able to taken into account. Somehow the EU Commission needs to find a better balance between the very strongly regulated tender procedures and the rather flexible framework contracts (once won). It can not be in the interest of the Commission to support the creation of such parallel universes. More and more conversations on EU communications have over the past year or so (for me at least) converged on the question: “where are the MEPs?”. Unfortunately it appears impossible for MEPs and the Commission to work together on communications. BTW, not all campaigns are stodgy and bland. But as I said earlier, the Commission gets the suppliers it deserves. They’re the market maker. And they hate taking risks. @ Jon: Whilst I – as you well know – agree that every communication campaign should be based on SMART objectives, it is a tad simple to ask what such campaign has changed. In many cases you will notice that the issues EC campaigns try to tackle can only aim to raise awareness amongst target audiences, because the actual decision-making power lies on the national level. We work a lot for DG EMPL and, as you know, employment and social affairs are national competences. Hence the EC can try to put certain issues on the public agenda, but real change can hardly be achieved at EU level. Also, in political processes it is often very, very difficult (and very expensive) to identify what or who were the actual drivers for change (in legal terms or in citizens’ attitude). Most large NGOs (the WWFs of this world) are very experienced in online outreach, but also they will mainly measure how many people they reached and thus how much awareness they raised; they will hardly ever be able to evaluate what impact their campaigns had on potential issue change. So to sum it up, campaign objectives should be defined in a way to allow measurement of their achievement; if and what ‘change’ they brought is a lot more complex. Well, the existence of firms offering comms services to the Commission is simply because the Commission is tendering for the services. What’s interesting is the self-selection going on: most of these companies only do EU work; whereas most comms consultancies, working elsewhere in this sector, generally don’t bother tendering for EC contracts (although there are exceptions). Why? Well, handling the EC’s procedures is too much for most companies (given what the EC pays), so the ones that do this work consider EC project management as one of their core competences. Sad but necessary. Even sadder: some of them specialise in winning contracts at impossibly low rates, and delivering predictably rubbish work. One of them is paying the price right now – after over a decade of poor delivery, they’re now losing over half their staff. Ten years is too long. But it’s simply unfair to blame most of these companies: the colour of the ocean is not the responsibility of the fish that evolved to swim in it. What I find encouraging is that so many of the people in these companies go Above and Beyond to deliver the best possible result, despite all the obstacles put in their path. Most of the people I know in this sector forgo more technically interesting work because they want to be a part of the European project. @Mathew – my fault for not following up..! @Tony – thanks for the clarifications, but isn’t ‘generating debate’ and ‘raising awareness’ a bit woolly as aims for a comms project? OK, perhaps my focus is too relentlessly online, but some SMART objectives always seem to help matters as far as I am concerned. The campaign may have reached lots of people, but what – concretely – did it change? @Mathew (on the substance) – fair point on Shift Mag (and indeed on Mostra’s eBook etc. ), but these can be funded by large firms that exist to a great extent because they live off Commission contracts, so I think it’s fair game to count them in the parallel universe. Don’t get me wrong – Mostra and Tipik and all the others are behaving rationally and sensibly from an economic point of view, and the very existence of such firms is precisely because the Commission does not handle the procurement process well, and has few staff dedicated to comms issues. So while I don’t say so in the original post I have a bigger problem with the Commission for creating this parallel universe than I do with the firms that seek to inhabit it. @paolabrussels and James Burnside) say about the lack of efficiency of some EC comms spending. However, to my knowledge, ShiftMag is purely Tipik-funded – basically a business development tool, so if it’s not EC-funded you can’t really include it in this ‘parallel universe’ (disclosure: my main client works with Tipik from time to time. And I have friends there). Anyway, I don’t actually see a parallel universe. The projects I’m involved with are simply supporting EC policies or programmes – there’s not much point, for example, funding research programmes for SMEs if the SMEs don’t know about it, and so don’t apply for funds! All national governments run comms projects to support their initiatives – it’s either that or triple the number of people in every comms unit, which would be much more expensive than contracting it out. The vast majority of comms work falls into this category, aimed squarely at the (specialist) audiences who are targeted by the policy or programme being supported. The process is also completely unmysterious – it’s called public procurement. Of course, if it was done better, the results would be better – less brochures and more online communities and social media, as I’ve been arguing for more years than I care to remember. What you have to remember is that the Commission get the suppliers they deserve: they set the rules for awarding contracts; decide what they want; write the RFPs; award the contracts; and administer the projects. Which is why some of the companies in this sector (not mentioned in your post) are utter, utter sh*te! I work in the communication unit of the European Commission’s DG for employment, social affairs and equal opportunities. We agree with you that the Commission should make sure that it gets value for money when it works with agencies like Mostra. The campaign you mention in your post was designed to provide information and generate debate about the 17% difference between men’s and women’s pay in the EU. The total cost of the year-long campaign was just under €1.8 million. The activities supported (on-line promotion, advertising, press relations, development and distribution of a toolbox, participation in events, production and distribution of audiovisual material etc…) generated over 81 million contacts. This works out at a cost of €14.9 per 1000 contacts. @James – thanks for your comprehensive comment. Very good to read! @Jeremy, yes MEPs can ask written questions of the Commission (and Council) on any issue, but the answers take weeks if not months to come back. It would need a concerted campaign to get useful answers and the questions would have to be framed very carefully (as do questions at Westminster). But beyond that, once MEPs get answers, they need to interest the press to go anywhere with an issue. Let’s face it, public money being wasted is not a “man bites dog” story. You need to have something more, officials on the take for example, and getting the evidence for that requires painstaking detective work beyond merely asking clever questions. @Jon Fair enough. I never thought I would be holding up the humble PQ as the indispensable tool of accountable government, but basically it’s the lack of interest in doing things like that makes the difference between the way the Commission behaves, and the way an accountable government behaves. That problem will hamper communications projects for as long as the Commission continues to contract them out. Often the proposals made by the winning tenderer are left aside when it comes to implementation. While a contractor is ready and able to move forward (both conceptually and technically), the client is not. Many institutional clients seem not to be open to taking advice on their communications strategy, or are not willing or able to make the case for new ideas to their hierarchy. The result is demotivating for the contractor’s staff, and that inevitably feeds through into the services they deliver. In terms of actual communications products, there’s still far too much emphasis on glossy brochures etc, which the guy at the bottom of the heap can show to his boss and their boss, etc. There’s far too much second-guessing of what those up the hierarchy want, rather than making proposals and defending them, not to mention the usual back-covering. Then there’s the copycatting. If one DG manages to put a toe into the future, then before long they all want the same thing. But of course, the first one has taken months after a new service/method/technology/application became available to take it up. And so it will take years for others to follow. There’s also the perennial problem of target audience. Very few institutional clients really know to whom, what and why they want to communicate. The result is unfocused products and services, trying to suit all but satisfying none, or focused products without the appropriate delivery mechanism. Lack of feedback and measurement of impact is closely linked to this problem. Finally, on a more general level, I don’t think a great many people inside the institutions, or in the contractors, have really adjusted to the challenges of communicating to 27 member states. It’s not just a question of scaling up and covering more languages. Personal familiarity with 15 (or most of them) was relatively easy to find in a small team; it’s much harder with 27. Wishy-washy, jack-of-no-trades products were bad enough for the EU-15, but much worse for EU-27. I think that the real issue at stake here is the way in which the Commission tenders out for such work. Too often stated objectives are vague or non-existent, with whatever drivel the tenderer may have copy-pasted at 4 am auto-magically transformed into the technical annexe of the contract. By the time the effective start date rolls around, solutions, objectives, tools and approaches are all frozen in time. Just think about how different the world of PR and communications was 18 months ago. So everyone is forced to carry forth with sub-standard approaches. The same problem arises with metrics. Milestones (bless them) are not concrete measurement objectives, and goodness knows that it is impossible to ensure results for communications initiatives with SLA-level precision. However, this should not deter public bodies from trying to get it right. So much communications spending is decided by project officers and fonctionnaires with little knowledge of communications. Perhaps hiring in some professionals with up-to-date market knowlege can help to ensure that tenders are drafted, selected and carried out with a view to maximising shareholder value. In this case, mine: I am the taxpayer, after all. @Jeremy – frankly I don’t think anyone in the EP can really be bothered. It’s easier to get budgets committee to approve a few million € for something than it is to actually get MEPs to site down in front of computers and communicate. And it’s not as if EP elections are ever decided on this sort of issue, sadly. I’m less familiar with the EP’s procedures, but if this were the UK government and I were an MP I would be putting down a Parliamentary Question (PQ) about the money paid to organisations like this, and the numbers of visitors, and any other indicators of what they have actually achieved. Does the EP PQ format allow something similar, and if so, does any MEP fancy doing it? I hope he likes his tofu polonium-spiked. It’s precisely because they are criticised for existing solely on the back of contracts from the EU institutions that Mostra, Tipik and their counterparts produce stuff like this. Giving something back to the institutions, if you like – albeit something they think they want to hear. It’s a way of boosting self-confidence of the company and some staff members. Plus of course it keeps their profile up both within the institutions and around Brussels. But it’s still a big waste of cash (except your fee of course, Jon;-).